The Mouse Keys feature of Mac OS X lets you control the pointer using the keys on the numeric keypad rather than the mouse. 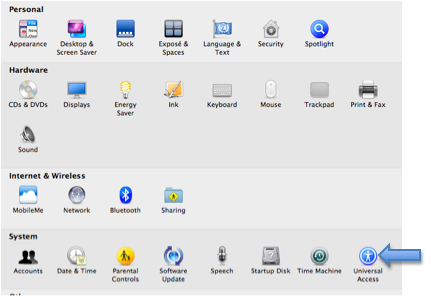 Select the Mouse & Trackpad pane. Select the On radio button for Mouse Keys. If you use a laptop that does not have a numeric keypad, you can still the Mouse Keys feature, but you will need to press the Num Lock key first. Once you have turned on the Num Lock, use the keys with the small numbers on them to control the pointer. The I key will perform a mouse click. Press the Option key five times to turn Mouse Keys on and off: creates a keyboard shortcut to activate Mouse Keys. Initial Delay: use the slider to set the delay before the pointer will start to move when you press a Mouse Key. Maximum Speed: use the slider to adjust the speed of the pointer when you use Mouse Keys. 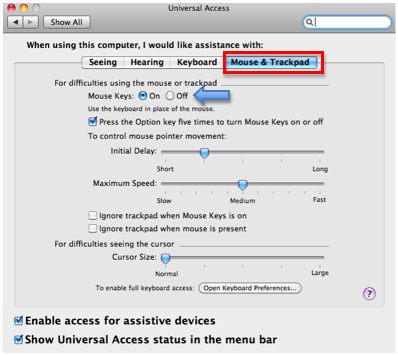 Ignore trackpad when mouse keys is on: will turn off the trackpad when Mouse Keys is turned on.